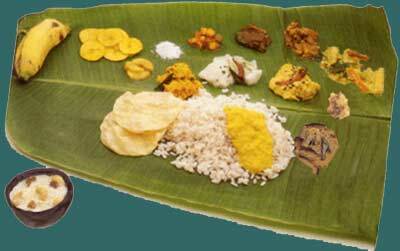 Onasadhya or onamsadya (The Meals) is the most favorite and delicious part of the Onam festival. It is considered the most elaborate and grand meal prepared for any festival in the world. There will be 11 essential dishes for Onasadya. Number of dishes may go upto 13. Earlier, Onasaya used to be even more elaborate than depicted above. There were about 64 mandatory dishes - eight varieties each of the eight dishes. At that time three banana leaves were served one under the other to accommodate all the dishes. Onasadya is to be consumed with hands and avoid spoon and fork to enjoy the real taste of Kerala. Rice is the essential and major ingredient of Onam Sadya. There is an old saying “'Kaanam Vittum Onam Unnanam” means “people should prepare Onam Sadya, even selling all there possessions". Rich or the poor, everybody, prepares Onasadya in a grand fashion as people of Kerala are extremely devotional and passionate when it comes to Onasadya. 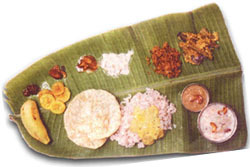 The food has to be served on a tender Banana leaf, laid with the end to the left hand side. The meal is traditionally served on a mat laid on the floor. A strict order of serving the dishes one after another is obeyed. Besides, there are clear directions as to what will be served in which part of the banana leaf.